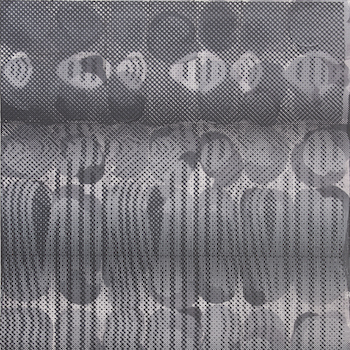 Reception: Thursday, March 28 at 6:00 p.m.| Artist talk at 6:30 p.m.
Graham McDougal's work begins with the printed page, which he considers to be a site and source for research. This involves photographing and scanning rare books, print ephemera and essays on art, typography and architectural design. He chooses pages that reference automation within modern industrial systems; the demise of labor and craft through technological advances in print production from hand-set type to digital-printing. Radical changes in the means of production alter the function and intention of objects; wartime aircraft factories, re-tooled for the peacetime provision of housing. Similarly, the distortion purposefully introduced during the digital reproduction begins to alter their function and intent. This influences the visual form of the work integrating analog forms of collage, drawing and painting with mechanical forms of photography and screen-printing. The University Art Gallery is located in the Theatre Building (Bldg 7) at Stanislaus State. Parking Lot 2 will be reserved for complimentary parking during the reception.